With small out of the way nooks and wide open spaces, this estate has it all. Indoor or outdoor, there is plenty of seating for entertaining and loungers for relaxing in the beautiful Costa Rica weather. An elevated par 3 golf hole rounds out the sports side of the properties amenities, while inside, a high-end poker table, 2 Punis billiard tables, foosball, flat screen HD televisions, and a state of the art sound system round out the indoor entertainment. With two swimming pools connecting the two houses, a multitude of outdoor patio and balcony spaces, a rancho, and several garden paths, Casa Ponte offers ample spaces to relax and enjoy the beauty that is Costa Rica. 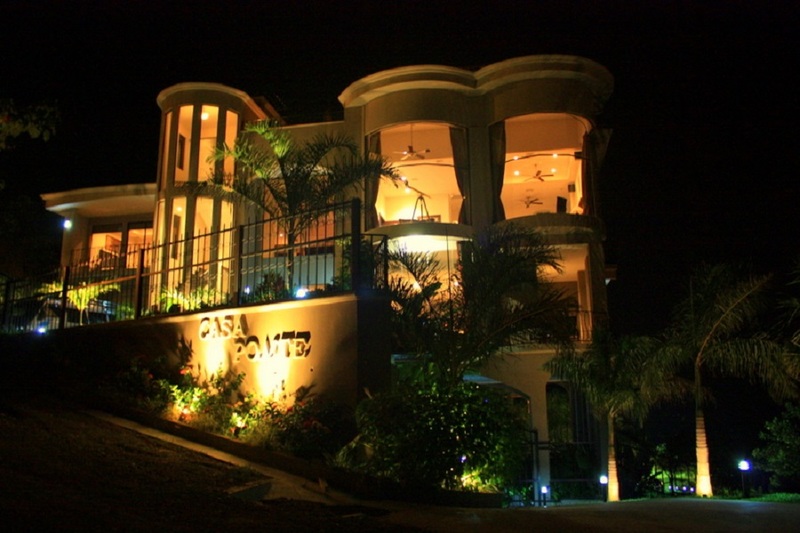 As soon as you arrive at Casa Ponte you will be impressed with the extensive living areas and entertaining spaces. Comfort abounds in seating areas with flatscreen TV’s, in the game rooms outfitted with billiards, and in the gourmet kitchen, dining area, and breakfast nook. Full height windows bring the outdoors in. While spacious, each indoor area is cozy and well equipped. You and your guests can spread out and enjoy private quiet time, or come together and celebrate in the wide-open entertaining areas. While in Costa Rica you will want to make the most of the year-round gorgeous weather. Case Ponte offers ample outdoor space and seating for your entire group. Two swimming pools with a waterfall and jetted tub offer tranquility and refreshment. The rooftop terrace boasts 360 degree views of the stunning natural beauty surrounding the property. You can even practice your swing on the par-three golf hole. Enjoy a relaxing meal or drink in the covered outdoor Rancho or simply lounge by the pool, its your choice.